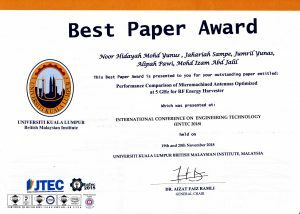 25 November 2018– Congratulations to Noor Hidayah Mohd Yunus (IMEN’s PhD candidate), and her supervisor, Dr. Jahariah Sampe for receiving Best Paper Award at the Conference ENTEC2018 held at Universiti of Kuala Lumpur, British Malaysian Institute from 19 – 20 November 2018. Noor Hidayah’s paper discusses the role of substrate material and structure manipulation using micromachining techniques to improve the performance of MEMS patch antenna in capturing the RF waves at the frequency of 3.9 GHz and 5 GHz. This study has also produced 1 patent.